Can I just take a second to swoon? Fennel pollen is a dream. I officially have a crush on the stuff and I am not even a bit ashamed. It’s floral and complex and imparts the delicious flavor of fennel in the most perfect way. Why have I not been tossing this stuff on everything? Fennel pollen cheerios? Fennel pollen Haagen Daas? Yes, please. Ok, maybe fennel pollen and ice cream isn’t the perfect marriage, but as part of the marinade for porchetta, it’s deliciousness personified. Authentic porchetta is a celebration of pork – a tender roast is marinated in olive oil, fennel and garlic, wrapped in pork skin, trussed and rotisseried over an open flame. The outside becomes super crispy while the inside of the roast stays moist. In Italy, this is street food at its best – tender slices are tucked into crusty bread to form an addictive panino. This version leverages a couple of different cuts to make the grade – a sirloin roast of pork is butterflied and stuffed with ground wild boar and pears. The entire baby is wrapped up like a package with peppery pancetta and roasted until crispy. I’d be lying if I said that it’s not a brilliant combo. Nay, a genius combo. 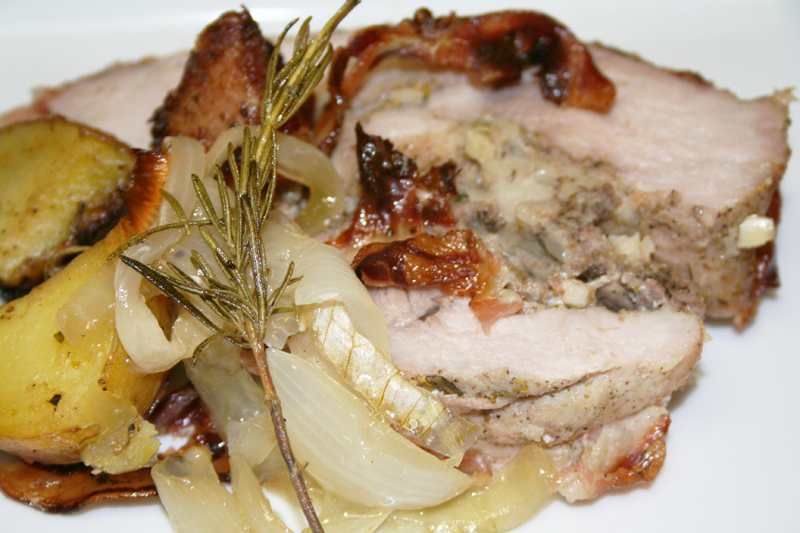 For a little extra sustenance, I roast the porchetta over a bed of herbs and onions. I also toss some quartered yukon golds with rosemary and olive oil into the oven and allow them to roast along side of the roast. It’s about as good a Tuscan feast as I can get, and for those blissful tastes of roasted pork and fennel pollen, I’m cheesing ear to ear. 1 pork roast, preferably sirloin and about 5 lbs. Begin by butterflying the roast (or have your butcher do it for you). Mix the fennel pollen, black pepper, garlic, rosemary, red pepper, salt and olive oil into a paste. Rub the roast with the paste and then place in a tupperware. Refrigerate overnight. In a large skillet, warm the olive oil. Add the shallots, garlic, celery and pears and cook until tender. Next add the ground wild boar, fennel pollen, fennel seeds, paprika, salt, white pepper, black pepper, cayenne, sage and thyme. Cook until meat is no longer pink. Add the butter to the pan and turn off the heat. Once butter melts, stir in the fresh bread crumbs. Let the mixture cool a bit and then stir in the eggs. Set the stuffing aside. Preheat the oven to 375°. Set up a roasting pan with a rack, lining the pan with the rosemary, thyme and sage. Top with the onions and pour the chicken broth and wine over the herbs and onions. Set aside. On a cutting board, line up slices of pancetta to form a base for the roast. Place the butterflied roast on top of the pancetta and fill the center with the stuffing. 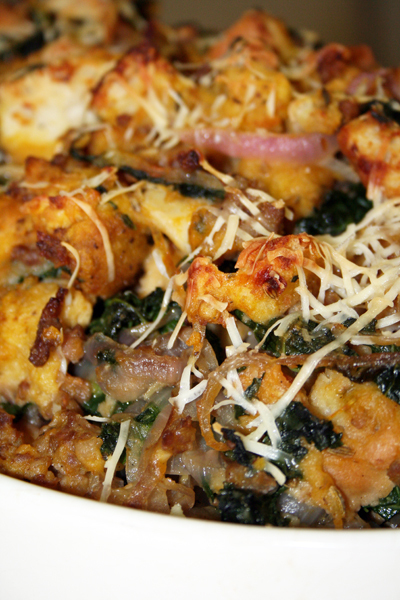 You may have more stuffing than you can use, but this can be saved for another dish, to include stuffing turkey breasts or mushrooms. Wrap the two sides of the roast over the stuffing to form a cylinder. Continue to cover the roast with slices of pancetta, leaving no gaps. Grab a length of kitchen twine and gently slide it under the roast. Tie a tight knot, holding the length of the roast together. Continue to tie rounds of twine around the roast perpendicular to the first tie. Once the roast is tightly trussed, set on the rack in the roasting pan. Pop the roast in the oven, cooking for about 90 minutes or until a thermometer inserted into the center of the roast reads 150°. After you put the roast in the oven, wash and quarter the yukon golds. Chuck in a baking pan with the rosemary, olive oil, salt and pepper. Bake in the oven with the roast, making sure to shake the pan around every 30 minutes to loosen the potatoes and crisp them on all sides. Once the roast is finished, let it rest for 15 minutes to keep it moist and allow the juices to redistribute. Slice the roast and serve with potatoes and the wonderfully melted onions and juices on the bottom of the roasting pan. And last but not least, add fennel pollen to the list of beneficiaries on your will for it is deserving of that much love.